For a dyed-in-the-wool pessimist, Wipers’ Greg Sage is a bit of a softie. “Why do people hate each other?,” he sings on Over The Edge’s “What Is,” “Why can’t it be just brother and sister?” But, while those questions may sound like direct descendants of the free love ideals of the late 60’s, in Sage’s hands they speak more about isolation and longing than about togetherness and harmony. 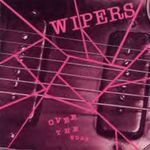 That angsty tug of desiring closeness—from a lover, from society, from one’s fellow man—and believing oneself unworthy or incapable of it pops up all over Wipers’ third album. Over The Edge was the follow-up to their breakthrough, Youth Of America, and you could string the two album titles together to paint a pretty accurate portrait of the characters that populate Sage’s songs: Youth Of America Over The Edge. Like Minor Threat’s Ian MacKaye, Sage sounds like an old soul trapped in a teenage mind-frame—on one song he’s “Living in Doom Town,” in another, “Only the good die young”—and, as a result, Over The Edge turns out an album-length skateboarding soundtrack. Behind every kick-flip lurks the possibility of broken bones. Nice to see you back - I was starting to feel like there was something left unfinished. Do they keep statistics on how many copies of an album were sold? I wonder how large this was on the radar at the time vs. looking back.